The luxury giant Swarovski normally produces jewelry accessories that correspond to each year’s SCS annual editions. During the “Wonders of the Sea” trilogy, the company produced the Swarovski SCS Clownfish Brooch. The Swarovski Clownfish pin, was produced in 2005, the same time as the Harmony figurine displays. The Swarovski Clownfish Brooch is oval, with a pair of clownfish swimming toward each other. The brooch is about 1.75 wide. The fish are reddish-orange with clear pave crystal stripes. Additional round Swarovski stones are located on the brooch to appear like air bubbles in the sea. This Swarovski Clownfish Pin was only available in 2005 and could only be purchased by Swarovski SCS members. The popular Swarovski book, Warner’s Blue Ribbon Book on Swarovski: Beyond Silver Crystal, shows a Swarovski-designated system number of 1514933. The Warner’s assigned a Swarovski ERV of $45 in 2011. 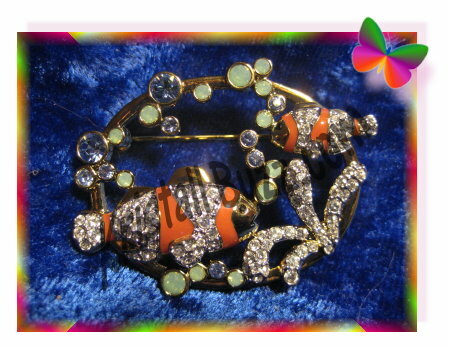 With this brief overview of the Swarovski Harmony Clownfish Brooch, we can share the news that we do have one on ebay, item #140728350047) at a realistic Buy-It-Now price, which includes FREE UPS Ground shipping. For other Swarovski SCS Jewelry items, crystal fanatics may check out the “Jewelry by Swarovski” category of the Crystal Exchange America website, located at www.CrystalExchange.com. Swarovski boutiques and retailers are hosting Jubilation Events at the end of February. 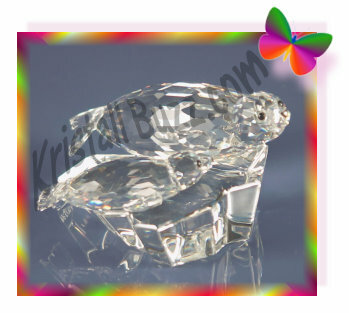 The Swarovski Jubilation takes place February 23 – 26, 2012. 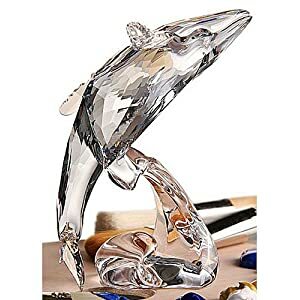 The Jubilation is a celebration of the 25th anniversary of the Swarovski Crystal Society as well as an instant redemption opportunity to purchase the Swarovski Paikea Whale. On February 23, a private SCS member reception is being held from 5:00 – 8:00 where exclusive SCS gifts can be obtained with “qualifying” purchases. From the postcard images, it appears that these SCS gifts include an SCS Window Gem and SCS Crystallized Chopsticks. 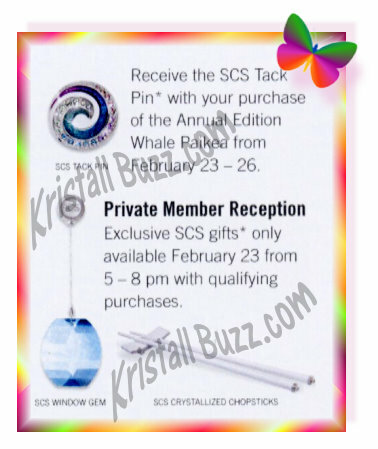 For all SCS members who purchase the Swarovski club Annual Edition Swarovski Paikea Whale during the Jubilation, those members will receive a special SCS Tack Pin. 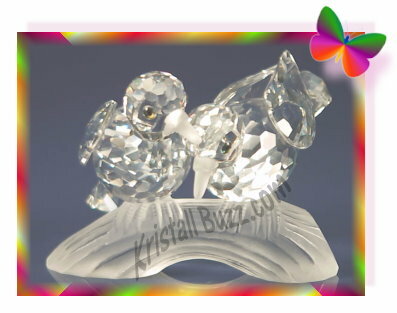 Swarovski crystal fanatics should contact their favorite boutique or store to see if they are hosting a Swarovski Jubilation Event. If you are a new Swarovski collector, use the Swarovski store finder to find a boutique or authorized retailer closest to you. 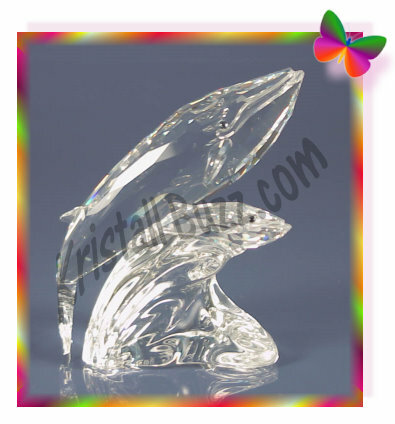 Also, new crystal collectors may be interested in obtaining older (retired) Swarovski club figurines. 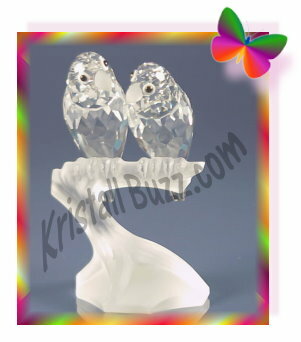 Retired Swarovski Club figurines from 1987 thru 2011 can be purchased at Crystal Exchange America. 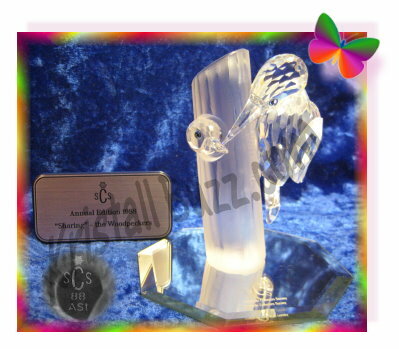 These Swarovski SCS figurines are in the category “Collector Society / SCS”, sub-category “Annual and Limited Editions”. 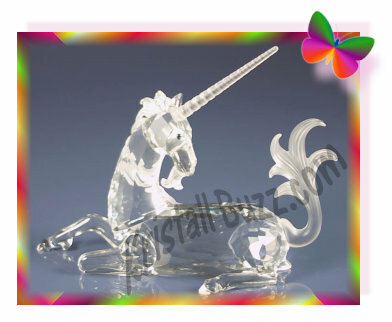 Swarovski SCS editions are among the most popular crystal designs that are sold on the online store of Crystal Exchange America. One of the more recent trilogies was the Swarovski Wonders of the Sea. The three Swarovski AE’s in the Wonders of the Sea trilogy are Harmony, Eternity, and Community. This trilogy was unique in a number of ways. 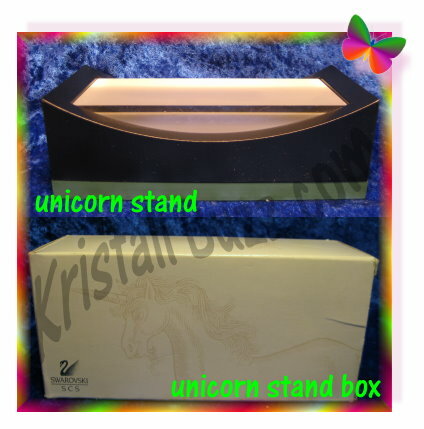 Clarifying the different offerings, Swarovski article numbers, availability…. 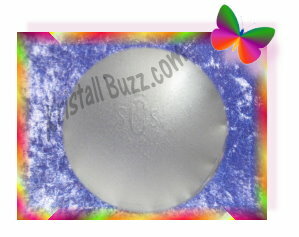 Swarovski Harmony (colored) – 7400 200 500 / 657 120. Community was designed by Heinz Tabertshofer. It was available for purchase only in 2007. For this trilogy, Swarovski released the center unit first, which was Harmony. In the picture, Harmony is shown with the colored clown fish. The next release, Eternity, is the leftmost unit. Eternity is shown with the clear turtle swimming toward the clown fish and blue coral. (Note how the fish near the top of the 2 displays flow together.) The final release, Community, is the rightmost unit. Community is shown with colored banner fish swimming toward the clown fish in the picture. 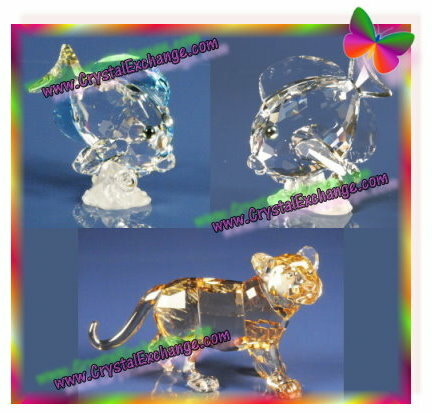 Crystal Exchange America has most of the Swarovski Wonders of the Sea figurines available in their online store. To see all the Swarovski SCS editions, view the Collector Society / SCS category. Or a shopper can use the store’s search feature and type in Harmony, Eternity, or Community, depending on the SCS edition desired. 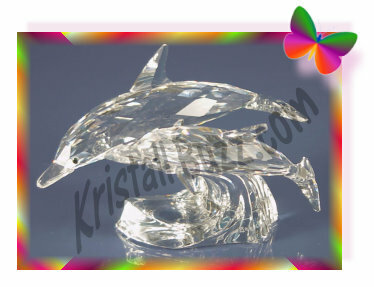 In 2007, the final year of the “Wonders of the Sea” trilogy (Harmony, Eternity, and Community), Swarovski offered a loyalty gift to an SCS member who purchased all three crystal figurines in the series. The loyalty gift for “Wonders of the Sea” was the Blue Tang Fish. If the member purchased all three “Wonders of the Sea” clear figurines, the Blue Tang Fish was clear. If the member purchased all three “Wonders of the Sea” colored figurines, the Blue Tang Fish was colored. The loyalty gift for this series was never available for purchase; it had to be earned. I found out, albeit the hard way, that my local retailer would sometimes use my SCS number, and other times my husband’s SCS number. I did not know this until I called Swarovski asking where my loyalty gift was. I was told that neither number was used for all three years, so I was not eligible to receive the loyalty gift. I wasn’t sure how that was my fault, nonetheless, no free gift. On the company’s web site, in an exclusive area containing Swarovski news, it is mentioned that there will be a loyalty gift in 2013 for SCS members who purchase annual editions in 2011, 2012, and 2013. It appears to be a secret at this time…..no clue if it will be complimentary to the annual editions for the three years, or a completely different figurine. So, knowing that Swarovski is continuing the tradition they began in 2007, make sure that you confirm your SCS number is being used when you make your Swarovski crystal Annual Edition purchase.